Everybody is talking about Simon vs. the Homo Sapiens Agenda! "A remarkable gift of a novel. "—Andrew Smith, author of Grasshopper Jungle"I am so in love with this book. "—Nina LaCour, author of Hold Still"Feels timelessly, effortlessly now. "—Tim Federle, author of Better Nate Than Ever"The best kind of love story. "—Alex Sanchez, Lambda Award-winning author of Rainbow Boys and Boyfriends with GirlfriendsSixteen-year-old and not-so-openly gay Simon Spier prefers to save his drama for the school musical. But when an email falls into the wrong hands, his secret is at risk of being thrust into the spotlight. Now change-averse Simon has to find a way to step out of his comfort zone before he's pushed out—without alienating his friends, compromising himself, or fumbling a shot at happiness with the most confusing, adorable guy he's never met.Incredibly funny and poignant, this twenty-first-century coming-of-age, coming out story—wrapped in a geek romance—is a knockout of a debut novel by Becky Albertalli. 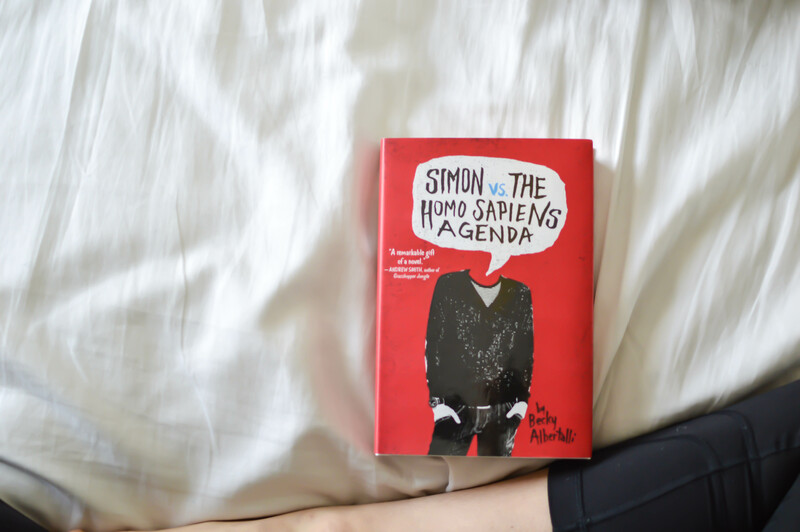 simon vs the homo sapiens agenda is a book everyone needs to read – and i mean everyone. this is a book i know will stay with me forever (or at least for a long long time). if you don’t already know, this is a “gay” book. even if you feel uncomfortable or somewhat opposed to people of LGBTQ, i still believe you should read simon vs.
i’ve read other novels that are LGBTQ, but i’ve never read one that was as wholeheartedly and honest as simon vs. everything was so relatable. in other novels, it was clear and obvious the characters that were LGBTQ were sorta different: in the way they act, speak, dress, etc. etc. however in simon vs., that was most certainly not the case. after reading this novel, i’ve realized that people who are LGBTQ are just like everyone else. there really isn’t a difference between gays and straights, except the preference in gender; in the end, that’s all there is. reading things from simon’s perspective, we could also see how the LGBTQ community is generally treated. it was beautiful to see people who were incredibly supportive, but also people who were just downright awful. i loved every bit of that. it was completely genuine and true. we saw everything: the good, the bad, and the ugly. my favorite aspect of the novel was how casual simon and his friends spoke of being gay. they would often joke about it – but not in anyway i found insulting or condescending. people often make this a huge deal, which i suppose it is a big deal, but sometime it shouldn’t have to be a big deal. 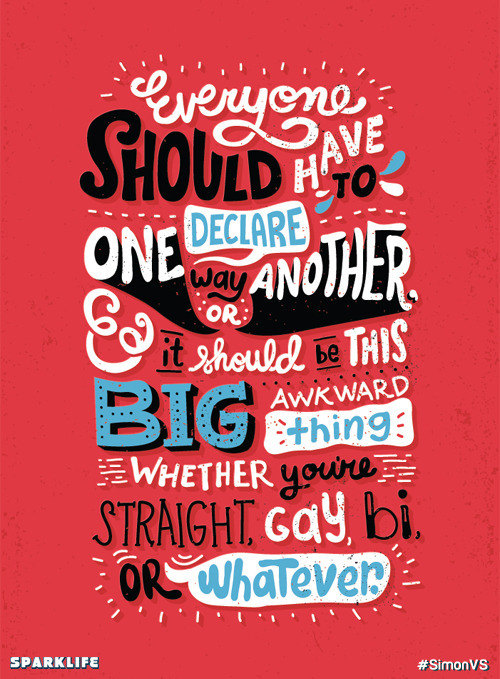 if you think about it, being gay/straight/etc is only a big deal because people make it a big deal. why should it really matter? it’s just a small part of who we/you are. i find it similar to a person’s race. for example, it’s not like you’re going to see someone and instantly judge them because of their race (if you do, then go away). the same should be said about a persons’ sexual orientation. moving on from the deep and somewhat controversial stuff, let’s talk about the writing and plot. the main reason why i enjoyed this book so much was because IT WAS SO CUTE. the interactions between simon and blue made me want to squeal; i couldn’t help but root for them until the very end. the relationships between everyone were truly genuine and lovely and just.. *content sigh*. his family and friends were great and everything was <3. simon vs. the homo sapiens agenda was like a diary. because the writing seemed like this, there were parts i really enjoyed, but also parts i didn’t like. i loved how we could hear and see simon’s internal dialogue. i mean, he’s hilarious and very relatable. i got to connect with simon much more because i knew what he was thinking. but, there were parts in the beginning i was left confused. since simon already knows these characters, there’s no introduction. we meet everyone and it’s like an information dump and you’re kind of left stranded like, “what’s going on?” also, there are less descriptions. i don’t describe people in my head, so it makes sense for the writing to be this way. but, i found it hard to visualize characters, places, etc. it was a quick read, which has it’s good and it’s bad. it’s a wonderful book to read in between huge series because it’s quite tiny, but because of that you’re left wanting more. the book concluded wonderfully, but since it’s so short i feel like i need just *holds fingers .00001 cm apart* that much more. overall, i loved this book. it was honest; it was hilarious; it was adorable; it was so much more. becky albertalli created a true masterpiece from beginning to end. with a easygoing prose, the story was filled with love, finding yourself, and truth for the LGBTQ community. i’ve come to realize that many people are simply ignorant to the way LGBTQ people are it may not be their intention to be condescending or offensive; they’re simply oblivious to it all. i would recommend this book to… um, everyone. *whispers* go read it. **on a side note: i saw this beautiful artwork by risa rodil and i had to share it with you. it was one of my favorite quotes from the novel! she made it for spark notes’s review on the novel. you can find her original post by clicking the image.